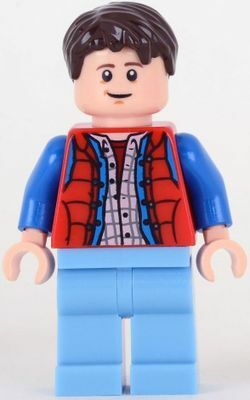 Marty McFly is a LEGO Ideas minifigure released in 2013. Marty McFly's has a dark brown, tousled hair piece that is used mostly in the figures Mutt Williams and Jake Raines. His head is double sided, the first side having a smiling face, and the second having a scared expression. He wears a plaid, white dress shirt, that is covered by a jean jacket, and finally a red vest over top of the jacket. Marty's jeans are represented by a light royal blue, unprinted leg piece. Along with Doc Brown, Marty is a main character in the Back to the Future. He and Doc frequently travel backwards and forwards in time to undo things, and then to fix their mistakes. Marty later had kids, Marty Jr. and Marlene .